This brief summarizes information on income and poverty in 2012, based on data released by the Census Bureau. Cited statistics include median household income in 2012, the number and rate of all persons in poverty, children in poverty, all persons and children under 50 percent of the poverty threshold, and African-American and Hispanic children in poverty from 2000 to 2012. 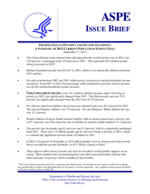 The data are based on information collected in the 2013 and earlier Current Population Survey Annual Social and Economic Supplements (CPS ASEC) conducted by the Census Bureau. Median household income was $51,017 in 2012, which is not statistically different from the 2011 median. For each year between 2007 and 2011 either poverty increased or median household income decreased. From 2011 to 2012, the percentage of the population in poverty did not increase nor did the median household income decrease. Today’s data indicate that there were 16.1 million children (persons under 18) living in poverty in 2012, not significantly changed from 2011. The child poverty rate was 21.8 percent, not significantly changed from the 2011 rate of 21.9 percent. For African-American children, the poverty rate reported today was 36.7 percent for 2012. The rate for Hispanic children was 33.8 percent. For non-Hispanic, White children the rate was 12.3 percent. Related children living in female-headed families with no spouse present had a poverty rate of 47.2 percent, over four times the rate of children in married-couple families (11.1 percent). The poverty rate for people age 65 and over was 9.1 percent, which is statistically unchanged from 2011. There were 3.9 million people age 65 and over living in poverty in 2012, which is a statistically significant increase from 3.6 million in 2011. In 2012, 6.6 percent of all people, or 20.4 million people, lived in deep poverty (had income below one-half the poverty threshold, or $11,746 for a family of four). These figures reflect money income only and do not reflect in-kind public supports or tax credits. More detailed data incorporating these and other noncash benefits and how they affect measures of poverty will be available in late October. For calendar year 2012, the official overall poverty rate was 15.0 percent. This is unchanged from 15.0 percent in 2011. In 2012, the total number of people in poverty was 46.5 million, statistically unchanged from 2011. The poverty rate in 2012 was 3.7 percentage points higher than in 2000. For calendar year 2012 the percentage of children (persons under 18) in poverty was 21.8 percent. This rate is not statistically different from 21.9 percent in 2011. The total number of children in poverty in 2012 was 16.1 million, unchanged from 2011. The child poverty rate in 2012 was 5.6 percentage points higher than in 2000. In 2012, 6.6 percent of all people, or 20.4 million people, had incomes below one-half of the poverty threshold. In 2012, 50 percent of the poverty threshold for a family of four was $11,746. These 20.4 million people with incomes below one-half of the poverty threshold represent more than two-fifths (43.9 percent) of those living in poverty in 2012. In 2012, 7.1 million children under 18 or 9.7 percent of all children were living in deep poverty. In 2012, the poverty rate among adults 65 and older was 9.1 percent, which is statistically unchanged from the rate in 2011. There were 3.9 million people age 65 and older living in poverty in 2012, which is a statistically significant increase from 3.6 million in 2011. The poverty rate among adults between the ages of 18 and 64 was 13.7 percent in 2012, unchanged from 2011. In 2012, children under the age of 18 had a poverty rate of 21.8 percent, statistically unchanged from 21.9 percent in 2011. In 2012, the poverty rate among adults ages 18 to 64 was 4.6 percentage points higher than for adults 65 and older, while these groups had the same poverty rate of 10.1 percent in 2001. In 2012, poverty rates for the under 18 and 18 to 64 age groups have increased 5.6 and 4.1 percentage points, respectively, since 2000. The poverty rate for those 65 and older has fallen somewhat since 2000. Note: Hispanic includes children of all races. White, Not Hispanic does not include any Hispanic children and starting in 2002 excludes White, Not Huspanic children reporting multiple race categories. Black or African-American includes Hispanic children and starting in 2002 includes Black of African-American children reporting multiple race categories. For African-American children, the poverty rate in 2012 was 36.7 percent. The poverty rate for African-American children in 2012 was 6.5 percentage points higher than the recent low in 2001. For Hispanic children, the poverty rate in 2012 was 33.8 percent. The poverty rate for Hispanic children in 2012 was 6.9 percentage points higher than the recent low in 2006. For non-Hispanic White children, the poverty rate was 12.3 percent in 2012. The poverty rate for non-Hispanic White children in 2012 was 3.2 percentage points higher than the recent low in 2000. In 2012, the poverty rate for children in married-couple families was 11.1 percent, up from a recent low of 8.1 percent in 2006. The poverty rate among children in female-headed families with no spouse present was 47.2 percent in 2012, up from a recent low of 42.1 percent in 2006. Children living in female-headed families with no spouse present had a poverty rate over four times that of children in married-couple families in 2012 (47.2 percent compared to 11.1 percent). The percentage of all persons living in poverty in 2012, 15.0 percent, was comparable to the past peak rates of 15.2 percent in 1983 and 15.1 percent in 1993. In calendar year 2012, the poverty rate for all African-American persons was 27.1 percent. This is statistically unchanged from 27.5 percent in 2011, and it is below the recent peak poverty rate of 33.4 percent in 1992. In calendar year 2012, the poverty rate for all Hispanic persons was 25.6 percent. This is statistically unchanged from 25.3 percent in 2011 and below the peak poverty rate of 30.7 percent in 1994. 1 The Census Bureau measures poverty by comparing total family money income (before taxes and tax credits and excluding non-cash benefits) to dollar value thresholds that vary by family size and composition. The weighted average poverty threshold in 2012 for a family of four was $23,492.